Car stop on White Horse Pike and Xanthus Avenue on July 23, 2013 at 4:12 a.m., leaves one charged with Unlawful Possession of a Handgun as well as Possession and Distribution of Drugs. Officer Ryba made the arrest. 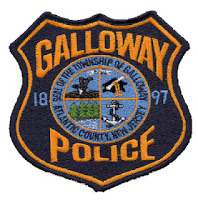 Galloway Township Police arrested Kenneth L. Brown Jr. of Pleasantville subsequent to a motor vehicle stop in Galloway Township on July 23, 2013 on the White Horse Pike. Brown was charged with Unlawful Possession of a .25 caliber Beretta handgun and Possession as well as Distribution of Marijuana and Prescription CDS. Brown was lodged in the Atlantic County Jail Facility in lieu of $25000.00 cash bail.